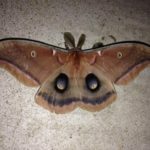 Named after the one eyed giant in Greek mythology the Polyphemus Moth is just about the most beautiful moth in our area. They range from here into the Midwest and likely beyond. They spread those four inch plus wings to reveal not just one eye but four; often enough to startle a would be predator. Larger than a monarch butterfly this is a very distinctive insect as is its bright green caterpillar.